Two additional alternative HVAC strategies are displacement ventilation and underfloor air distribution. 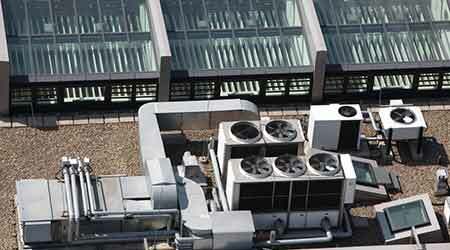 For certain building types, this approach can be a very effective cooling strategy. In delivering conditioned air at floor level, the more buoyant, warmer air is displaced and naturally floats to the ceiling level. As a result of stratified conditioning of only the lower occupied space, energy is saved. While this sounds good in theory, the practical issue is the need to move a lot of air. Essentially, removing heat from the space requires twice as much air as a VAV system, so air velocity control is critical. Once the air velocity surpasses a certain level, the result is a well-mixed system, which means that the bulk air becomes the same temperature, as opposed to stratification, which is the key to the technology’s effectiveness. Overall, the thermodynamics taking place within the space are complex, so a number of controls need to be in place, and the environment has to be just right. In addition, when employing displacement ventilation, the delta T between the supply air and room temperature must be limited to 10 degrees in order to maintain comfort, as opposed to a conventional 20 degrees. It can be challenging to work with this smaller temperature range while mitigating humidity. The other issue is application. While displacement ventilation works quite well in large volume spaces such as atriums or theatres — where it’s more practical to pull the air in low — it can be more challenging in an office environment where ceilings are lower. While underfloor air distribution (UFAD) is often touted as having benefits similar to displacement ventilation systems, the two are different animals. UFAD is similar to displacement ventilation in that the supply air is delivered low and extracted high. But that’s where the similarity ends. Although it is sometimes said that air will be well stratified in office environments using UFAD, the reality is that the air is well-mixed. When using UFAD, the bulk of the air within a space is nearly uniform in temperature, and one of the major benefits of displacement ventilation — stratification — is nullified. The reason is that the diffusers used to supply the air to the space have some practical limitations. First, diffusers must rely on the same temperature difference limitation as displacement, but still be flexible to allow for freedom of movement, or lack thereof, as well as changing conditions during the day. The common swirl diffuser used today is effective, but the swirl pattern induces room air to mix with the cool supply air and the result is a well-mixed room, which is exactly the same result achieved using a conventional overhead VAV system. And, while users can manually adjust their swirl diffusers, they don’t. Unfortunately, this means that many UFAD systems don’t actually operate as variable air volume systems (many systems have no automatic flow limiting devices), and act more like constant volume systems. And, while there are excellent examples of effective UFAD systems, there are enough poor performers to make it clear that they require more coordination to design and build.